¿Cuál es la pregunta de hoy? Estoy muy bien, aquí por Málaga, dándome una vuelta, y hoy no hace demasiado calor, así que estoy estupendo. And if you’re fairly new to the language, that’s quite a tricky answer! So… in order to respond to this learner need, we’ve put together a brand new course. It’s time to take what you’ve learned in the early stages of the language, and move further with it. We’ve headed out onto the streets of Spain with our camera and asked native Spanish speakers some questions. We’re calling this Coffee Break Spanish – To Go. Coffee Break Spanish To Go is a short course featuring 10 videos, each video asking a different question. While the questions in this series may be quite easy to begin with, the answers range from a few words, to complex sentences spoken quickly in local accents – and this is exactly what our learners have been asking for. We’ve provided subtitles in Spanish so that you can see exactly what each interviewee says, and there are, of course, language notes with explanations of the grammatical and cultural elements covered. 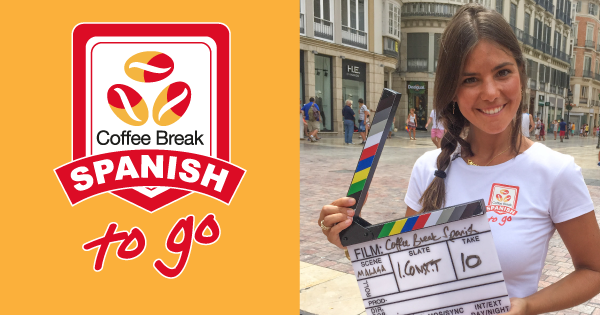 Coffee Break Spanish To Go launches on Monday, the 7th of November. This season is aimed at learners working on Season 1 and Season 2 of Coffee Break Spanish, but we hope to add more series featuring more complex questions and answers in the future. I am almost through with season 2 in CoffeeBreakSpanish and have bought season 3 also, so I gave it a shot and must say, I like it. From the presenter to all the people. Would like it to be longer and more lessons, but it’s ok for now. Hi, I am looking for your new videos on Coffee Break Spanish – To Go but I can’t find them. Can you direct me to them please? Hi Siobhan. Our Coffee Break Spanish To Go series is available here: coffeebreakspanishtogo.com. Hope that helps. Many thanks. I have found it and purchased.